In collaboration with composer Danny Clay, make music for his exhibit with artist Jon Fischer using only sine waves and turntable surface noise. Deadline: This project’s deadline is 11:59pm (that is, just before midnight) wherever you are on Monday, April 2, 2018. This project was posted in the afternoon, California time, on Thursday, March 29, 2018. Tracks will be added to the playlist for the project’s duration. Step 1: Tracks in this project will be played as part of a free event in San Francisco at the McEvoy Foundation for the Arts (mcevoyarts.org) on Saturday, April 7, 2018, for an exhibit by composer Danny Clay (dclaymusic.com) and artist Jon Fischer (feather2pixels.com). The project was developed in collaboration with Clay. Before proceeding, consider the sort of music that might be conducive as partially-heard, partially-background music for an art event. 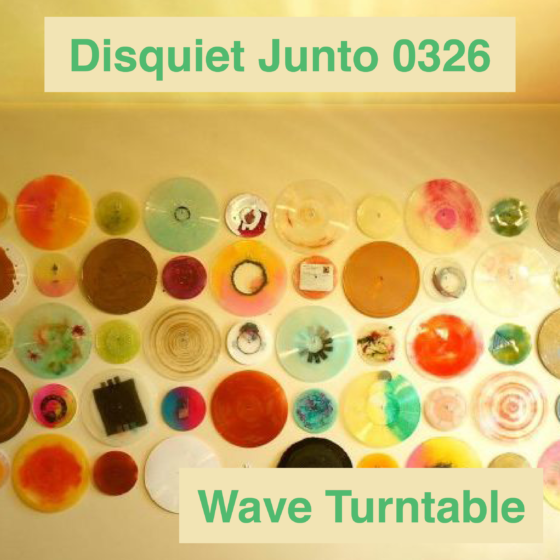 Step 1: Include “disquiet0326” (no spaces or quotation marks) in the name of your track. Step 2: If your audio-hosting platform allows for tags, be sure to also include the project tag “disquiet0326” (no spaces or quotation marks). If you’re posting on SoundCloud in particular, this is essential to subsequent location of tracks for the creation a project playlist. Length: The length is up to you. Roughly two to four minutes sounds about right. Title/Tag: When posting your track, please include “disquiet0326” in the title of the track, and where applicable (on SoundCloud, for example) as a tag. The image associated with this project is by artist Jon Fischer from his exhibit with Danny Clay.